I was happy to see that Coastal Scents introduced nail polish to their product line a couple of weeks ago, and now Stila has also entered into the polish arena! 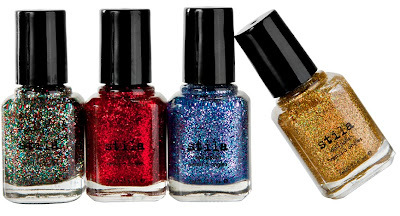 I just received an eMail introducing their polishes, and they are beautiful and glittery! You can view their polishes here. According to their web site, they are offering two sets--the Daring Collection (top) and the Delicate Collection (bottom). The bottles are 0.25 fl. oz. in size, and they are sold as four piece collections. Each collection is priced at $24.00. What do you think of about these? I have and love quite a few Stila cosmetics products, so I'm happy to see them offering nail polish! holy poop I want all of these!!!! I want them all! But they're a bit pricey for how much you're getting. They're each only 0.25 fl oz -- most polishes are around 0.40 fl oz. For $6 each it's not too bad of a deal, but I'll probably wait for a good sale/coupon. Cool! I always feel like you tell us about so many different collections that I don't hear of elsewhere, so thanks! pretty...but for that price I'll pass. $24 for a set of tiny bottles seems a bit steep. Hopefully they will have a sale, I'll pick them up then! I would love to own them but they are really pricey!! these look super fun!! can't wait to see swatches!! I love the nail polishes, but the price is too much, $6 per bottle... I can buy full size OPI nail polishes for less than that. What do I think? I think I want them all! I'm glad to see Stila is selling nail polish again! I have two colours (Rhea &Nymph)that I bought from them over 10 or 12 years ago and then they just stopped selling polish, so I'm looking forward to checking the new ones out. Wondering how they look on the nails. I don't know if there's anything really special here. 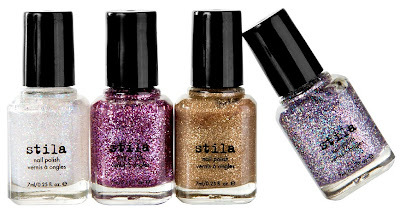 Yummy - I have never tried any polishes from Stilla. They seem to not come into Sephora and that is where I pretty much depend on seeing Stilla anything.